How does 'Tear Here to Open' work? Why is it easier to tear there as opposed to anywhere else? What is its physics? All the force will be concentrated at the tear (the tip of the tear) if there is one. With no tear, all the material helps to hold itself together — but with a tear, all the force is localized at this tiny point and only a tiny amount of material is responsible for holding on. The stress at this tear tip (the force per area) becomes huge because the area is very small and it overcomes the strength (the maximum stress) of the material. On the illustration below you can clearly see that only a few particles are helping to hold the material together — they carry the whole burden. The colours show the stress distribution. Were the material flexible and less rigid, the stress would have been spread more out, since the bonds between atoms/molecules would allow some stretching for them to "lean back" on their neighbor atoms/molecules. 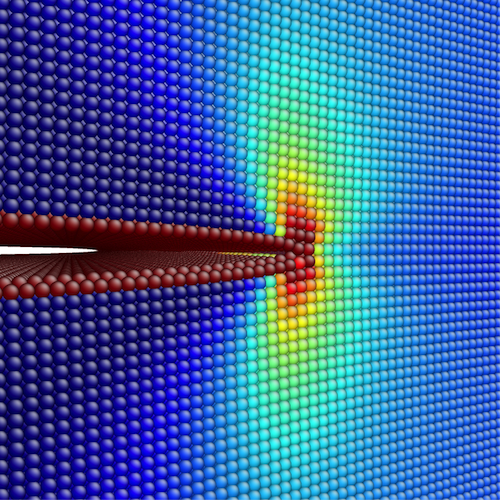 This is why a crack propagates very fast in rigid or brittle materials like concrete or glass — a material might be strong and can withstand large forces for a long time, but as soon as a single tiny crack appears, the whole thing breaks in a split second because all the force is suddenly on just one point, which breaks and lets the next point take over, which breaks etc. The more rigid and brittle the material is, the less flexible and deformable it is, meaning that the material will not absorb as much of the energy but instead have it all concentrated at the crack. This is why glass looks like it almost explodes when cracking — the cracks are propagating at huge speed. Plastic sheets on the other hand will only tear in two if, along the way, you help and localize your force correctly, and you can control the speed. It will also feel warmer at the tearing edges, because energy was absorbed. When you apply force to a tear, the tear with propagate somewhat randomly from the tip (depending on the material, of course; for an extreme example, no tailor would ever cut any sizeable length of cloth along the threads, they rip it as this is both faster and more accurate). However, if it started out at the right place (i.e. at the "tear here" mark, or from a hole in the perforation), then the probability that it hits the next hole in the perforation is quite high. Once it does, the tear moves to the end of the new perforation it hit, and starts applying the force there. Once again a tear starts forming and propagates more or less randomly until it hits the next hole from the perforation. This is also what goes wrong when the perforation fails to guide a tear (which happens on occasion): The tear you're making misses the next hole of the perforation and finds its own way through the material, and if this goes unchecked, the tear can deviate quite drastically from the "tear here" line. You can see the holes or punctures as a way to provide the materials in question with a "path of least resistance", along which the tearing proceeds (well, in most cases; when I try to tear off a strip of stamps it happens frequently that the stamps themselves are torn apart, which is why I always make a fold in the little pieces of paper between the holes). Tearing a piece of uniform piece of paper will give a tearing path that's rather erratic (except that the tearing goes from one side to the other side when you move your hands away from each other). But when you puncture the paper in a straight line, the tear will follow this path of least resistance. Of course, it depends on the material (brittle, solid, elastic, thick or thin, etc.) how to puncture it. Or you can make different holes or punctures for the same material, and find out what way works the best. You can try to make a wavy line of holes in paper which goes only downwards (if you let the series of holes bend upwards, the path of least resistance won't be the one that goes back up; the tearing paper will proceed erratically downwards, which obviously has less resistance than following the holes back upwards). It's a nice subject to experiment with. Not the answer you're looking for? Browse other questions tagged newtonian-mechanics forces everyday-life material-science or ask your own question. Why does work equal force times distance? How do bicycle spokes work? How does a Photocell/Photoresistor work?